Back from a stint in the pen ~ Boston mobster, accused killer and all-ground great guy “Whitey” Bulger (Johnny Depp) is in the midst of a turf war with his competition on the streets of his home town. Caught between enforcing the law, and hiding all of Bulger’s “missteps” and ”mistakes”, Connelly finds himself way to deep in the middle of Bulger’s mess to ever get out…. 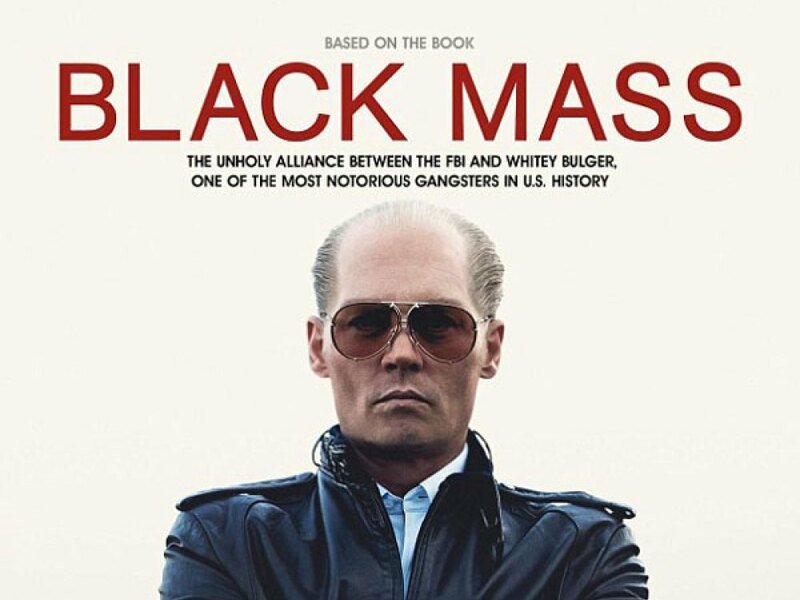 I give BLACK MASS a rating of: MUST SEE ON THE BIG SCREEN!! Depp is flawless playing BULGER, even with his balding head and thick Boston accent. And I must admit going in, I was afraid that this film might just be filed with the SAME OL’ JOHNNY, but I was pleasantly surprised to see how awesome he was in this role ~ no Capt. Jack here!!! Cumberbatch is also superb as Bulger’s younger brother, playing the “good guy” of the Bulger clan…or is he??? And Connelly was excellent too, playing the FBI agent who has apparently forgot the oath he took, oh, and the difference between right and wrong. And, this next statement was as much of a surprise for me to say, as you are going to be hearing it, but Dakota Johnson was also stupendous playing Bulger’s Baby mama – she is out acting her mother and father combined in this small, but poignant role!! BLACK MASS is so intense, so fast paced, so GOODFELLAS feeling that my inner MOBSTER MOVIE LOVING psyche was screaming yes, yes, yes ~ this is what I have been waiting all Summer for ~ Mobsters, crooked FBI agents, and it’s all a Real-life story…now how much better can it get…seriously!!! I am so excited to hear that this is good! I love Johnny Depp and have always been a fan of mobster/Mafia movies. Goodfellas is one of my dessert island flicks for sure. Looking forward to seeing Black Mass soon!